Please help to maintain our golf course by following the simple steps below. The lowest handicapper in the group is responsible for the group’s course care. Before leaving a bunker, a player should carefully fill up and smooth over all holes and footprints made by him, and then leave the rake outside the bunker on the painted T.
If required rake other affected areas. Remove any loose turf from the affected area. Knock in all sides of the edge of the divot with your club or your shoe. 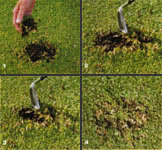 In taking practice swings players should avoid causing damage to the course, particularly the tees by removing divots. Always lower the flagstick by club or by hand. Golf carts can only be driven by those who have been given approval to do so. Users are required to abide by the Rules governing the Use of Golf Carts. Greens are cut in a predetermined order. On days on which competitions are programmed, the aim is to cut each green before players on the time sheet are in a position to reach any particular green. In the event of players in a competition being ready to play a green, the staff are instructed to stand aside and allow the players to proceed. On other occasions, ie no competition or members playing earlier than times shown on the time sheet, the Greens Staff are instructed to proceed with their programme of work. There are good reasons for this procedure, including the need to complete essential work on the entire course in the time available after allowing for scheduled competitions. On such occasions players must allow work to proceed be it on the fairway, tee, green or practice fairway. Players must not hit if Course Staff or machinery are in range.